Deep statistical gameplay, Accessible and customizable, Very fun and intense games. Price can be a limitation, Games can take a while, Very basic graphics. If you like baseball and want to try something different, challenging, and accessible, I can’t recommend Dynasty League enough. Learning to drive doesn’t require any real knowledge of how a car works. That said, many people take real pleasure in learning the intricacies of the combustion engine anyways. From there, they can tinker and tweak, with the end result being greater (or at least more personalized) performance. The same can be said about Dynasty League Baseball Online. You can jump in with only a basic understanding of how the game works, and still find success. But with a little bit of study, you’ll unearth the complexities of the game; in doing so, you’ll set yourself up for a great--and very deep--game of baseball. I’ve written a lot about this gameplay in the past few years (http://www.operationsports.com/games...ball-online/); the game remains largely the same. 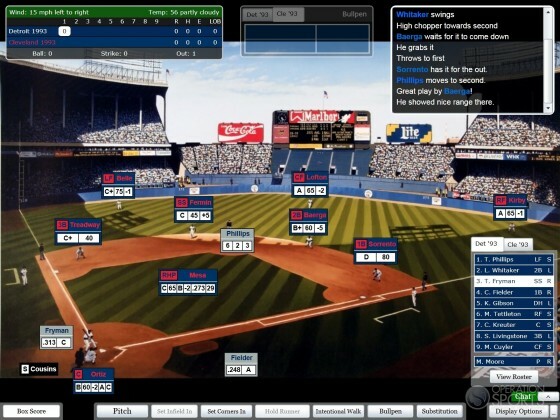 Dynasty League Baseball Online is a baseball simulation, driven by dice rolls and player cards. These player cards are very intricately tied to real stats; play long enough, and your stats should mirror what actually happens on the field. The beauty of this system is that it doesn’t necessarily require you to fully understand how it all works. The essential stats--things like batting average, throwing rating, stamina--are clearly visible. In fact, the game allows you to limit the information you receive to just the results, or play-by-play. On defense, you can set your defense, intentionally walk, or pitch, based on the current match-up. When batting, you can call for bunts, steals, hit and run, etc. You can do all of this based on just those visible basic ratings. But again, if you dig into the actual player cards, you can grasp a greater sense of what can and might happen. If you call for a hit and run, do you limit your batter’s potential power? Should you even try to steal, based on catcher’s throw rating and pitcher’s hold rating? Looking into the numbers, you can get a real and accurate percentage of what the results might be. By carefully reading the rules and cards, the level of care applied to the ratings is becomes fully apparent. Speaking of results, the game factors in nearly everything that can happen over the course of the game. Injuries, ejections, weather effects, individual umpires, stadiums, and team chemistry all have a role in the outcome of the game. In one of my recent games, a thunderstorm delayed the start of the game; this resulted in a double-header and reduced player stamina. I witnessed a player beat out an infield hit based on his hustle and team chemisty. 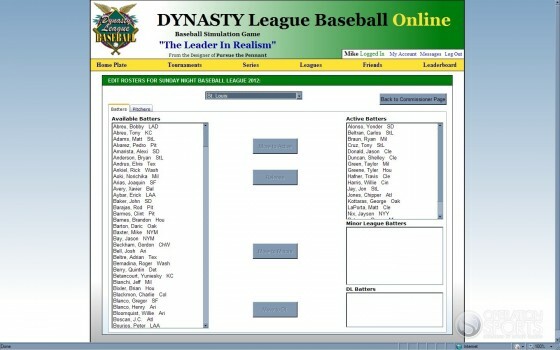 Dynasty League Baseball Online is a browser-based game, which is really a double-edged sword. On one hand, you can play it on nearly any computer, simply by using a standard web browser. It loads easily and quickly, and the interface is clean and simple. On the other hand, don’t expect flashy visuals. Animations are reduced to sliding player icons; die rolls are static photographs of actual die rolls. Much like other text sims, though, graphics are perhaps the least important part of the game. That’s not to say that this is an ugly game. In fact, there are relatively high-quality day and night photographs or artist representations of each stadium depicted. Play in Milwaukee in the 80s, and you’ll see play on a great retro photograph of County Stadium. Additionally, the textual play-by-play is well-authored and sufficiently varied. Dynasty League Baseball is best when played against other users, in either a league or tournament. While you can stick to a particular season (including 2012), I’ve had the most fun competing in “Greatest Team” leagues and tournaments. These are limited to 83 of the greatest teams ever, and create a great sense of “best of all time” each time you play. However, there are options for “keeper” style leagues, drafted leagues, varied playoff structures, and one-off games or series. The options are, frankly, a little overwhelming if you are new. You can also play against a computer manager if you’d like to hone your skills before facing a live opponent. Human players offer the best experience, and thankfully, the game makes scheduling (or rescheduling) a match-up very easy. If you can’t make a game, proposing a new time/date is simple using game’s internal messaging system. Beyond that, you can “program” a manager to handle your team for you in your absence. I will say that playing a series can take a while; I’d estimate a three game series can take roughly two hours. They are an enjoyable two hours, but committing to that long play time can be tough for some. Of course, you don’t have to play all the games--but you’ll probably want to. One of the neatest things about playing in a league is comparing the real stats to the simulated stats. By keeping track of a wide variety of statistics, the game creates a unique world with interesting (but statistically probable) storylines and outcomes. The only hurdles I can see in fully recommending this game are the graphics (not a big deal), time to play games (maybe a bigger deal for some), and the price (perhaps the biggest deal). This game does operate at a monthly price point of $14.95 (it’s cheaper if you lock in for six months). For those who play other online multiplayer games, this is a reasonable price considering all of the modes and teams you have access to. For those used to paying a flat $60 for a game, I’d recommend trying the six month plan. I’d wager you’ll get your $60 worth (or, at least try the two day free trial). 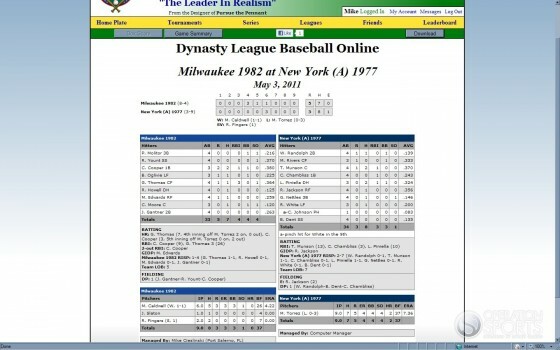 Dynasty League Baseball Online occupies an interesting place in baseball gaming. It’s a text sim with roots in a dice and card game. It can be played solo, but is much better with others. It produces ultra-realistic stats and scenarios in a fantastic, all-time great setting. It’s very accessible, but also tremendously deep. It is also sort of like a multi-player fantasy game, without the dependence on current results. Learning Curve: Again, as deep as you want it to be. The more time you spend learning the intricacies of the game, the more you’ll feel rewarded. Visuals: A very basic but usable interface. Background era-specific stadium pictures are nice. Simulational Realism: The players are carefully rated in numerous ways; technically the longer you play the more your created stats should match the actual/historical stats. Lasting Appeal: So many ways to play, tons of teams, and plenty of historical seasons. The biggest limitations are time and price. The way season replay leagues work is that the Commissioner can choose to assign a person to a team or a computer manager. The ability to assign a computer manager to a team is a brand new feature in the Commissioners tools. The Total Replay League (you can find their league page in the new DYNASTY League Baseball Online Private League Directory) is the first multi-player real time season replay league in the history of baseball sims. Yea I've pretty much just given up on this... Their to busy trying to reinvent the wheel... Smh. There really isn't any difference in DYNASTY League Baseball Online season replays other than how you choose to assign the teams (to a friend or a computer manager) it works the same way. You could then use the Edit roster Commissioner tool to place the players on their respective teams. The last thing you would do is use the Schedule Builder Commissioner tool to enter your schedule. Dan Treuden posted a new Excel file that creates schedules over in the DYNASTY League Baseball Facebook group file section which is very helpful. The scheduler that would have actual MLB schedules is on the future features list along with a few other things to improve the season replay experience. Everything is there right now where you could do your own season replay and that is how the season replay leagues like the Total Replay League are able to run right now that you see in the Private League Directory - the difference is that you would be assigning computer managers to the teams instead of friends. The easiest thing to do right now is join one of the ongoing season replay leagues since they have everything already set up and ready for you to play. If you click on the Private League Directory button and then click on the Total Replay League you can see what a season replay league looks like. One other note is that all the contiguous seasons from 1996-2013 are available right now to start a season replay. The reason all the contiguous season are in first, is so that past season draft leagues can start from as far back as 1996 and then go to the next season (1997, 1998, 1999, etc). On our TO DO list is to make available the past seasons that are not contiguous so that you could have a single season league or replay from the past using seasons from our current season library including 1957, 1967, 1970, 1973, 1974, 1982, 1993 and 1994. These seasons just mentioned ARE available right now to be played in any ‘Series”. League play is booming at DYNASTY League Baseball Online. More than 50 new Private Draft Leagues and Season Replay Leagues have launched over the past year. In addition, there has been 68 Greatest Team Public Leagues that have launched. I love this product but I want to be able to play it solitaire. Dynasty League Baseball/Pursue the Pennant has seen plenty of my money come to them over the years and to get anymore of my patronage, I just want to play the game the way that I like to play it. I have been playing Strat-O-Matic Baseball on windows and while it is a solid product, I just would prefer to play DLB... As soon as season solitaire replay options are available, I will be back with Mr. Cieslinski and his products. Don't think it's gonna happen, heck I have old emails saying they would have it next year and next year never comes. The intend purpose of the product certainly seems to deliver tho. I just don't think it will ever be up to the standards of a true replay type of game, meaning as on par with the rest of what's out there as far as solitary replay. But do wish them the best in the direction they are going! @Yount19 Solitaire series play has been part of DYNASTY League Baseball Online with every season in the DYNASTY League Baseball Online library since 2010. Right now you can also conduct a season replay with you managing your favorite team and the other teams controlled by computer managers. The ability in the Commissioner Tools to assign teams to computer managers as well as friends was added about a month ago. @MrMagoo. This isn't reinventing the wheel. 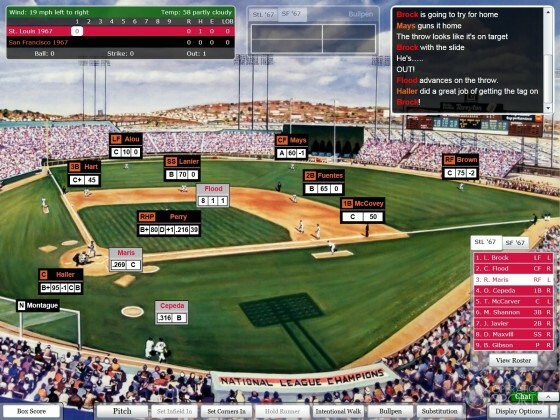 DYNASTY League Baseball Online is the first and only real time multi-player Baseball simulation out there. True, meant it in more general terms just in regards to online baseball. Was not a very good or consice statement by me now that I think about. I do apologize. Thanks, will certainly check it out. Great! The previous post #23 details the process of setting up a season replay. There are now more than 50 active Private Draft and Season Replay Leagues in the new Private League Directory located at the "Leagues" link. But... can I see ANY of the computer managed games? If I can, I may check the DLB Online game out again.